For more than 44 years, the principals of Cappello Global, LLC and its affiliates have been providing innovative investment banking services, encompassing a broad range of transactions, to public and private companies in more than 50 countries around the globe. 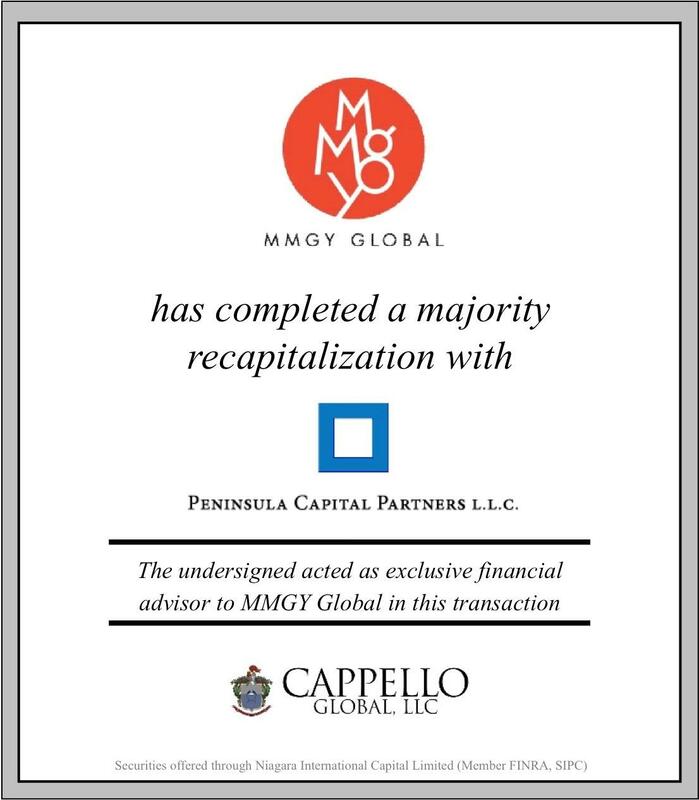 Cappello operates with a core philosophy of guiding our clients to sustainable, long-term strategic and financing solutions, rather than focusing on a deal-by-deal basis. Our approach resonates with our clients, builds trust and is evident in our client testimonials. 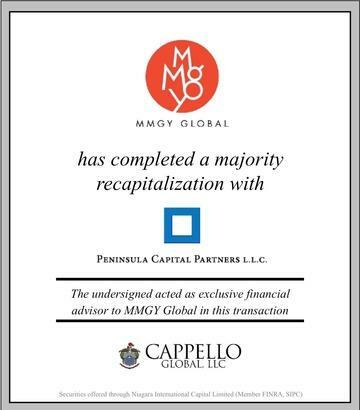 Cappello professionals have decades of experience in advising business owners on initiating and executing successful M&A transactions. 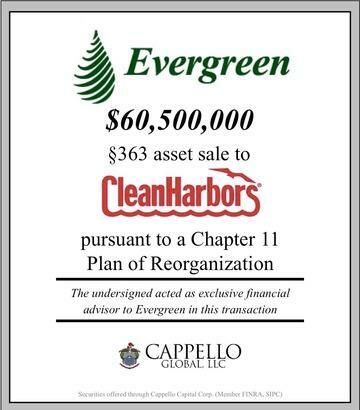 The sale of a business is a complex process that requires significant preparation, deep and current strategic and financing market knowledge, broad strategic and financial buyer relationships, specialized negotiating skills and a dedicated investment banking team with extensive execution experience. 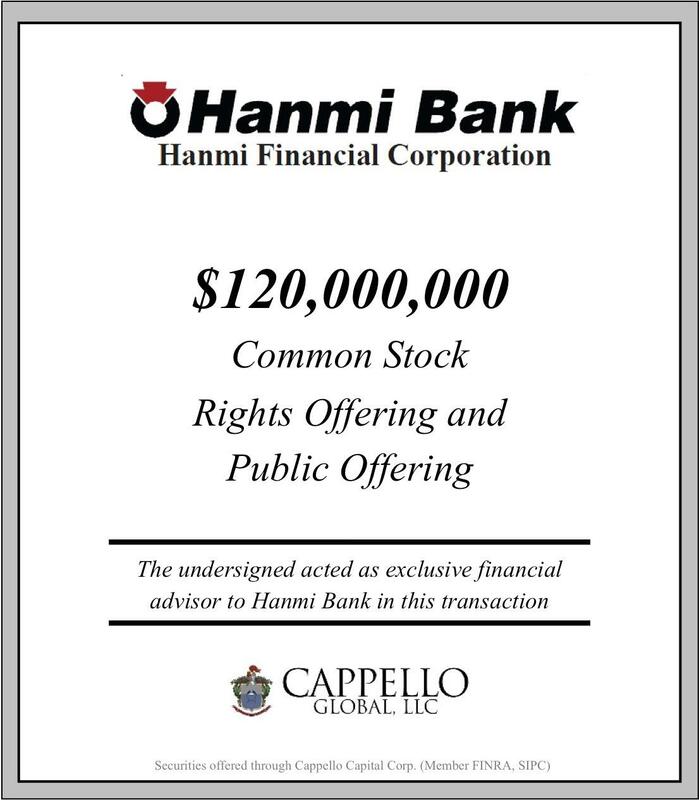 Cappello professionals have successfully advised on the sale of public and private companies ranging in value from tens of millions to billions of dollars. Our senior team focus, in-depth due diligence and disciplined transaction process have earned us a reputation for certainty of closing and exceeding our client’s expectations on valuation and terms. Many businesses employ acquisition strategies to enhance growth, vertically integrate, eliminate competitors, expand geographically, or acquire new products, services or technology. Acquiring a business is a significant undertaking that requires careful research, mindful relationship building, refined negotiating strategies, rigorous target due diligence, detailed integration planning, and a dedicated investment banking team with extensive execution experience. 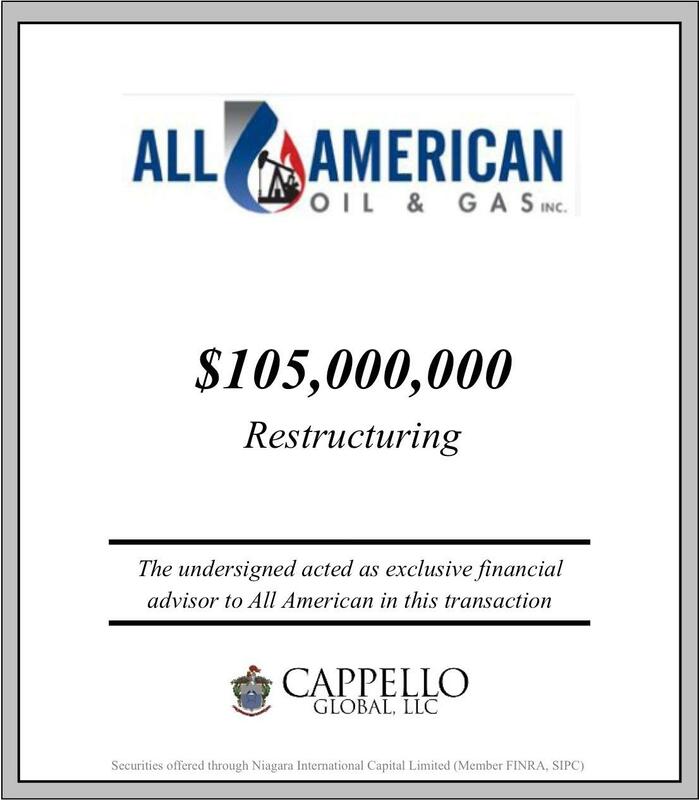 Cappello professionals have successfully advised public and private companies on acquisition transactions with an aggregate value in the billions. 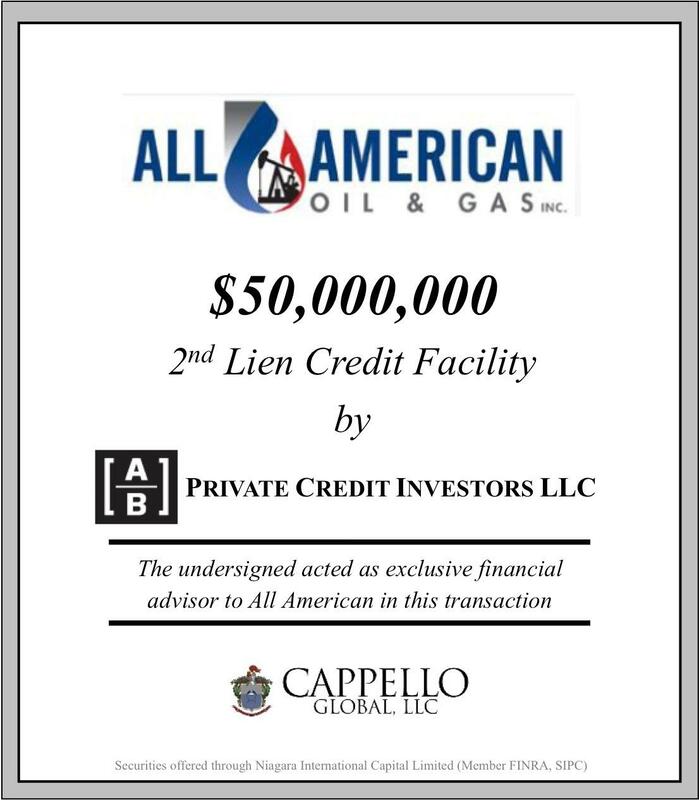 Our seasoned team of bankers serve a role similar to that provided by the internal M&A departments of large corporations; we dig deeper than most investment banks in our due diligence, seeking to uncover risks that could impact the target or our client’s business. Our team runs a disciplined and efficient transaction process that is designed to identify, evaluate and qualify relevant targets prior to conducting comprehensive due diligence, negotiating terms and proceeding to a closing. 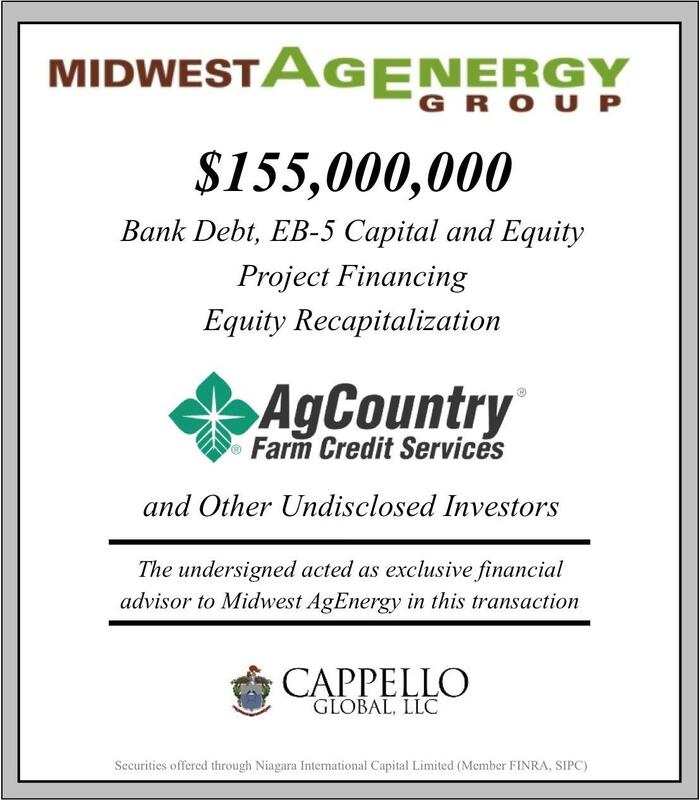 Many businesses seek institutional equity financing to generate liquidity, execute on growth opportunities, fund acquisitions or facilitate the buyout of a family member, business partner or shareholder. 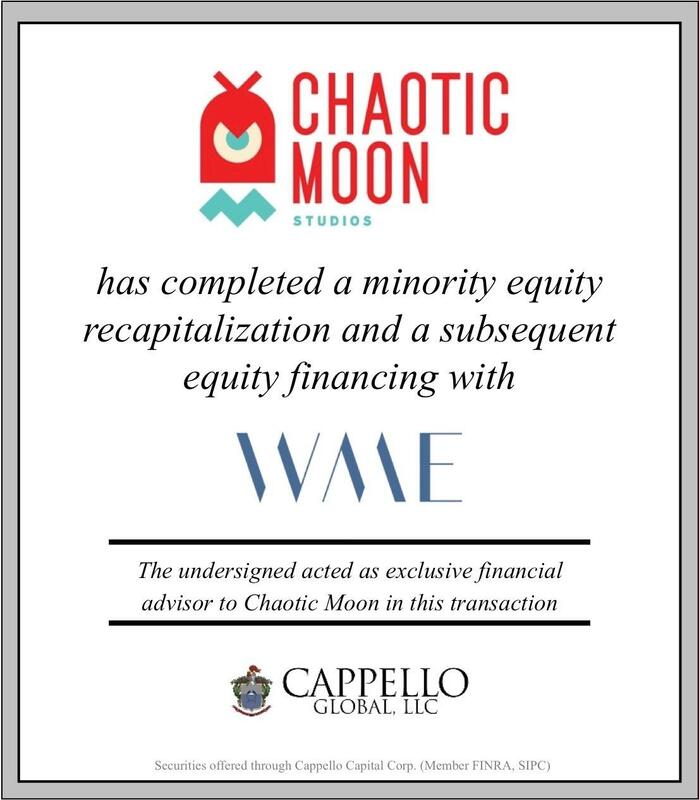 Institutional equity capital may take the form of common stock, membership units, preferred equity or other hybrid equity securities – each with a range of potential terms and considerations. Closing an institutional equity financing with the right partner under optimal terms and valuation is a complex process that requires significant preparation, deep and current market knowledge, extensive institutional equity relationships, and a dedicated and seasoned investment banking team with relevant transaction execution and negotiating skills. 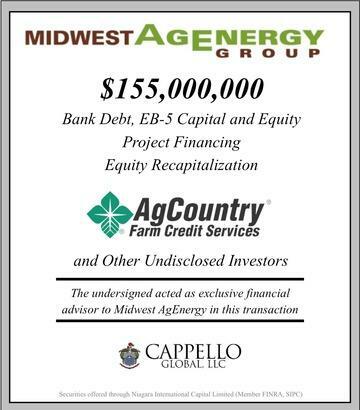 Cappello professionals have successfully advised public and private companies on equity financing transactions ranging from tens of millions to hundreds of millions of dollars. 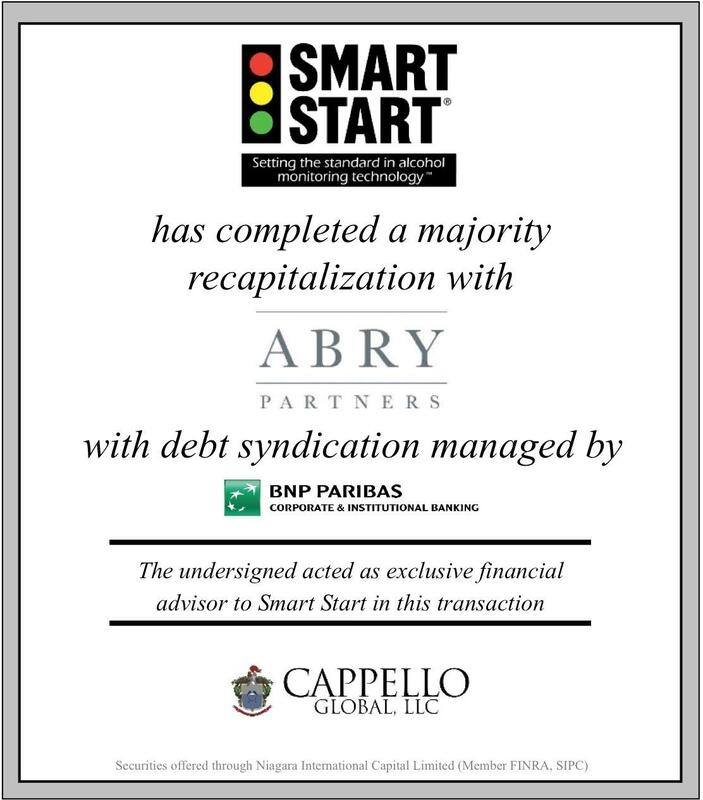 Our senior team focus, comprehensive due diligence and disciplined transaction process have earned us a reputation for certainty of closing, and exceeding our client’s expectations on valuation and terms. 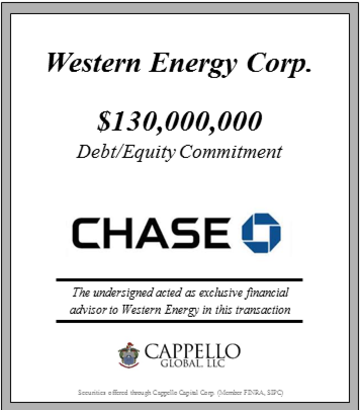 Most businesses will require debt financing at some point to fund working capital requirements, execute on growth opportunities, fund acquisitions, refinance existing facilities, finance a dividend recapitalization or facilitate the buyout of a family member, business partner or shareholder. Institutional debt capital may take the form of senior, subordinated, mezzanine, uni-tranche or other hybrid securities – each with a range of potential terms, pricing and structural considerations. 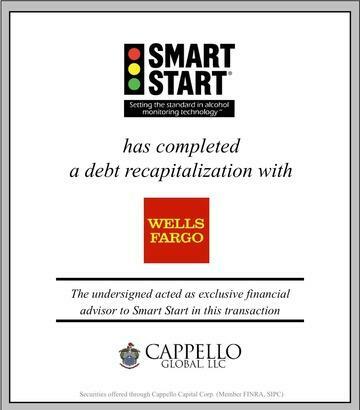 Completing a debt financing with the right lender and at optimal terms and pricing requires significant preparation, deep and current market knowledge, extensive bank and non-bank lender relationships, and a dedicated and seasoned investment banking team with relevant transaction execution and negotiating skills. 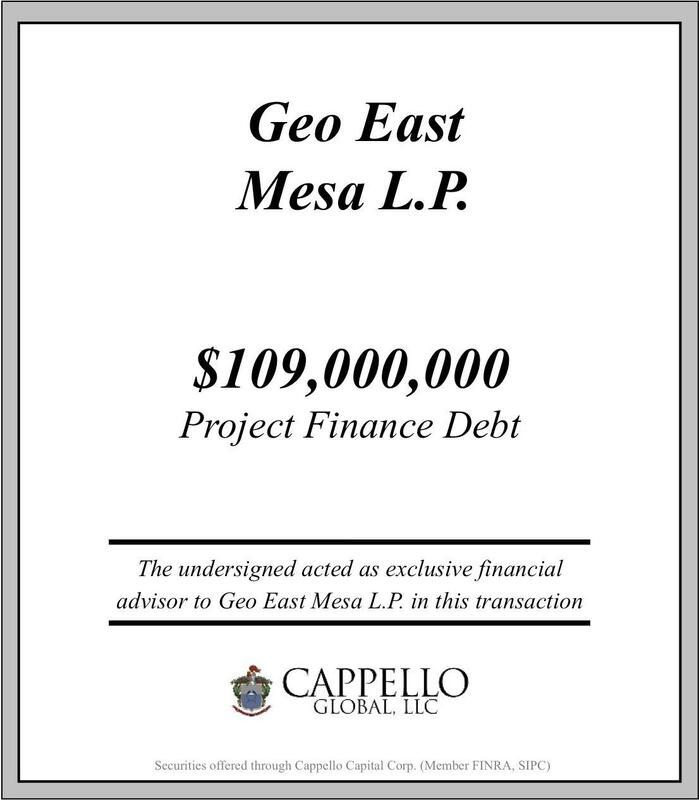 Cappello professionals have successfully advised public and private companies on debt financings with an aggregate value in the billions, with individual transactions ranging from tens of millions to billions of dollars. Our senior team focus, comprehensive due diligence and disciplined transaction process have earned us a reputation for certainty of closing, and exceeding our client’s expectations as to leverage, pricing and terms. 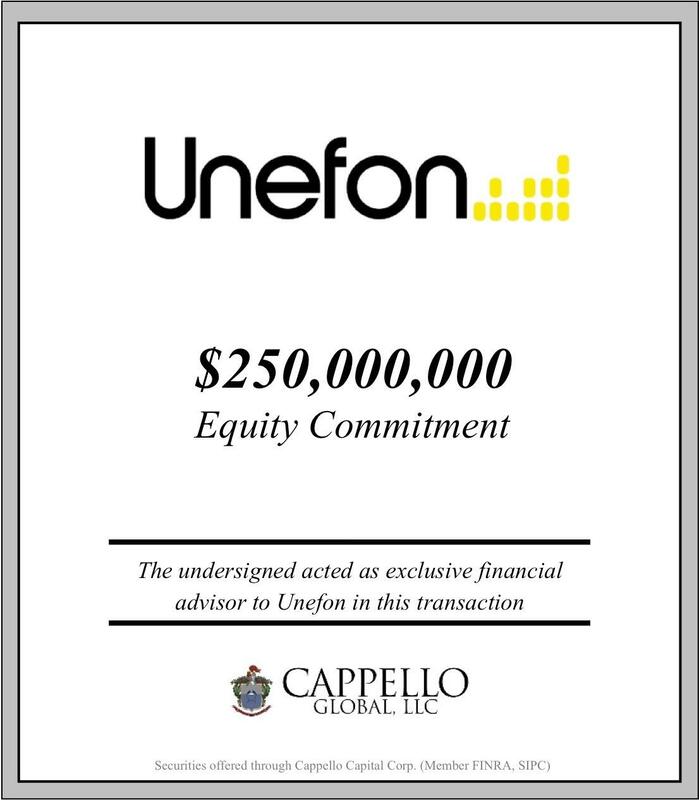 For decades, Cappello has been recognized as an innovator in the capital markets, employing creative strategies and innovative financing structures to achieve our client’s specialized and project financing goals. 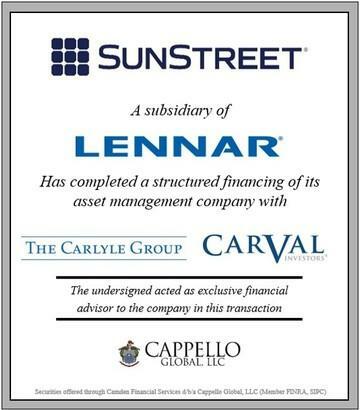 Completing a specialized financing transaction with the right financing partners and an appropriate structure and terms is a complex process that requires significant preparation, deep and current knowledge of the financing markets, extensive institutional equity and debt relationships, and a dedicated investment banking team with relevant execution experience. 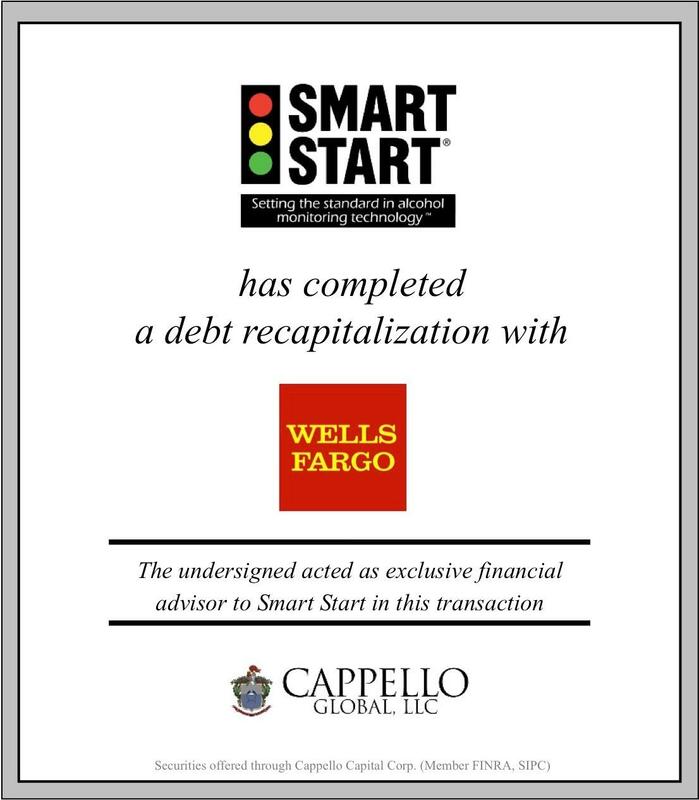 Cappello professionals have successfully initiated, structured and closed billions of dollars in specialized financings, in transactions ranging from tens of millions to hundreds of millions of dollars. 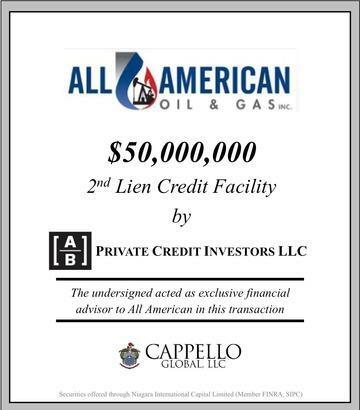 Our senior team focus, technical experience, comprehensive due diligence, and disciplined transaction process have earned us a reputation for certainty of closing and exceeding our client’s expectations on terms and cost of capital. Many businesses and government institutions require project financing to grow and fulfill their mandates. Project financing may be needed to: build a new plant, refinery or other commercial facility; develop traditional or alternative energy assets; or, complete a major infrastructure project. 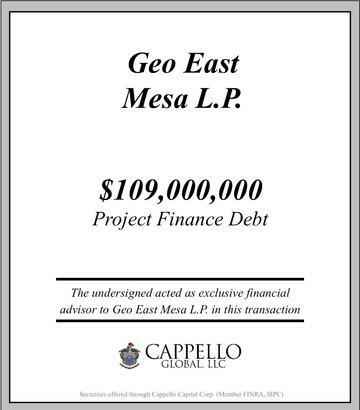 Project financing capital structures often include both equity and debt and can include a wide range of securities, tax-related financing, or government funding or guarantee programs – each with a range of potential terms and structural considerations. 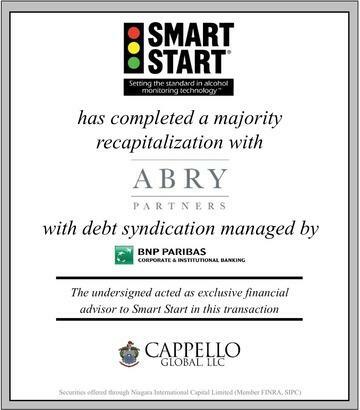 Completing a cohesive and successful project financing with the right financing partners and an appropriate structure and terms is a complex process that requires significant preparation, deep and current knowledge of the financing markets, securities structuring experience, extensive institutional equity and debt relationships, and a dedicated investment banking team with relevant execution experience. 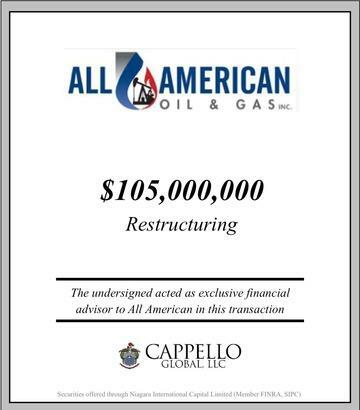 Cappello professionals have successfully advised on billions of dollars in aggregate project financings, in transactions ranging from tens of millions to hundreds of millions of dollars. 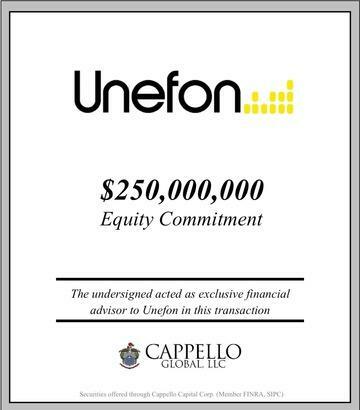 Our senior team focus, comprehensive due diligence, and disciplined transaction process have earned us a reputation for certainty of closing and exceeding our client’s expectations on terms and cost of capital. 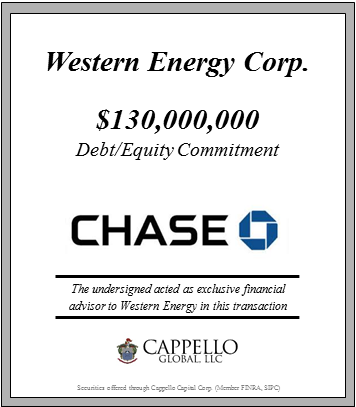 Cappello served as exclusive financial advisor to Western Energy Corp.
Cappello served as exclusive financial advisor to Geo East Mesa L.P. Many business owners and leaders benefit from third party strategic advisory services. 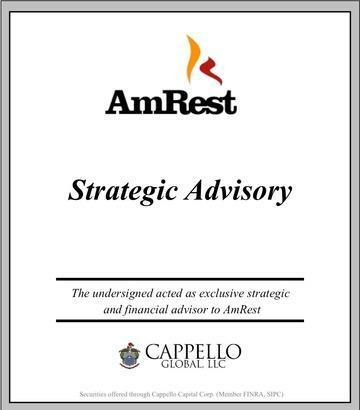 Strategic advice may be needed to: assess growth or transaction alternatives; develop a long-term strategic plan; develop or enhance a board of directors; augment management teams; or, assess and/or structure third party partnerships. 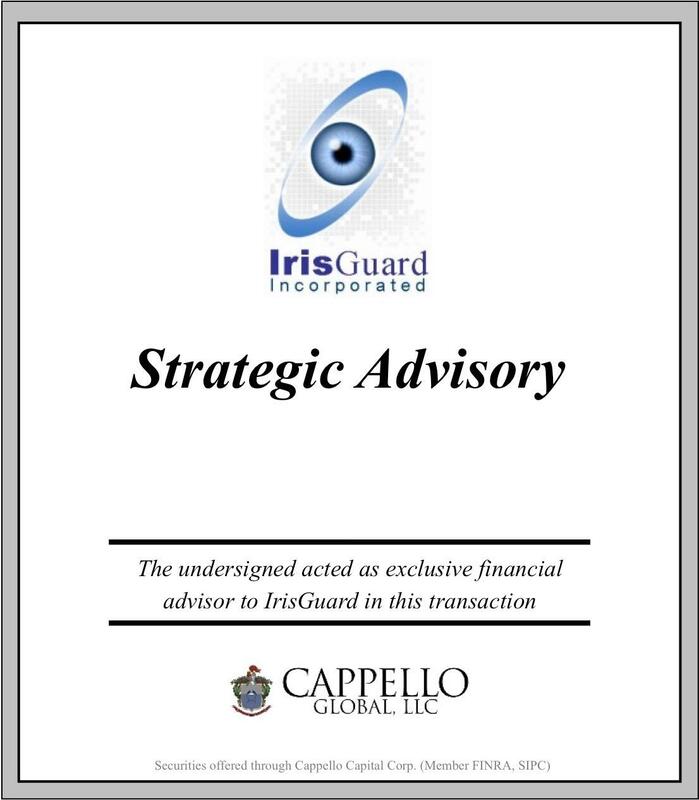 Alex Cappello served as a member of IrisGuards board for 6 years, where he helped the company to formalize strategic planning, improve financial reporting and internal controls and raise capital. 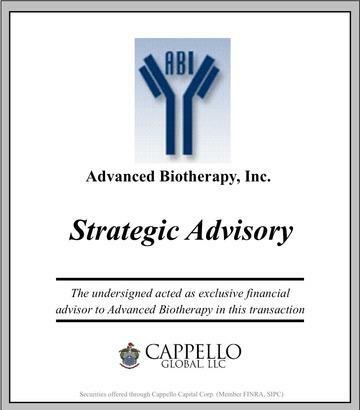 Cappello served as exclusive financial advisor to Advanced Biotherapy, Inc. The Company needed to develop a financing strategy that would allow continued growth and expansion while working within the restrictions of its franchise agreement with YUM! 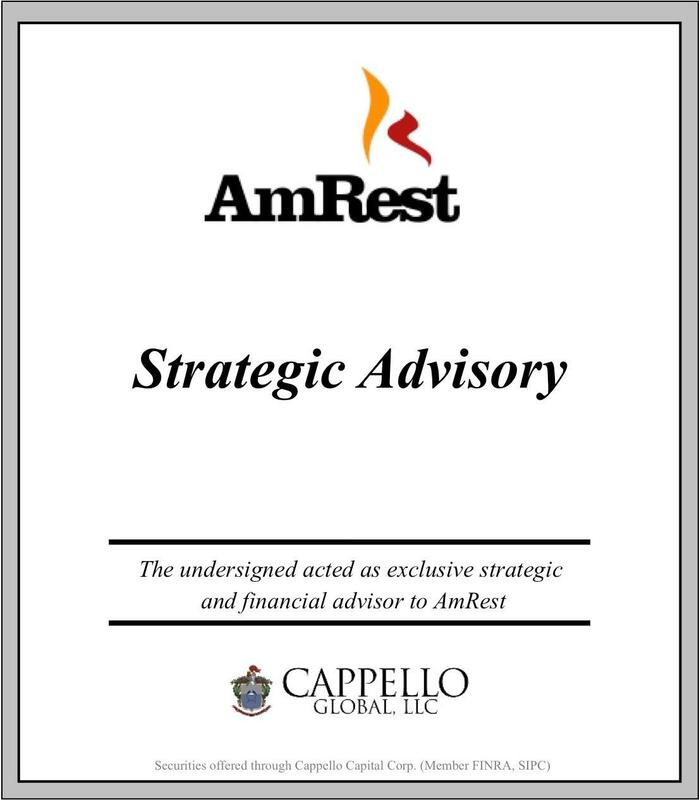 Cappello served as exclusive strategic advisor to AmRest Holdings N.V.
As a result of the volatility of the market or business cycle, or other circumstances, many public and private businesses will have a need for restructuring services. 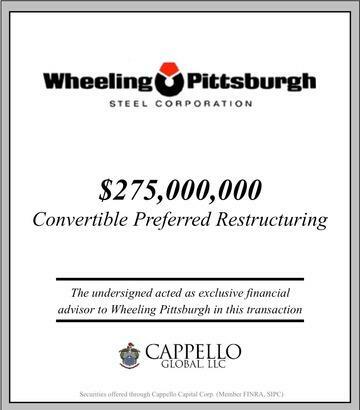 Restructuring services may be needed to: restructure existing financing arrangements; shed non-core assets; effect a material shift in business focus; obtain fresh capital to refinance existing obligations, unlock intrinsic value; or, better position a company for growth. 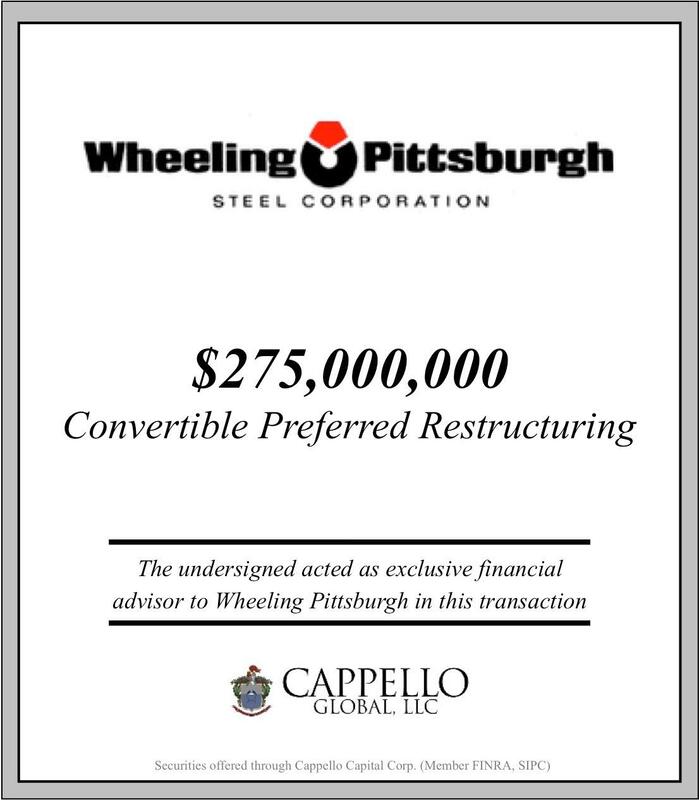 A restructuring may require guiding shareholders, creditors and executives through a court supervised or out of court restructuring process, which are highly specialized areas. 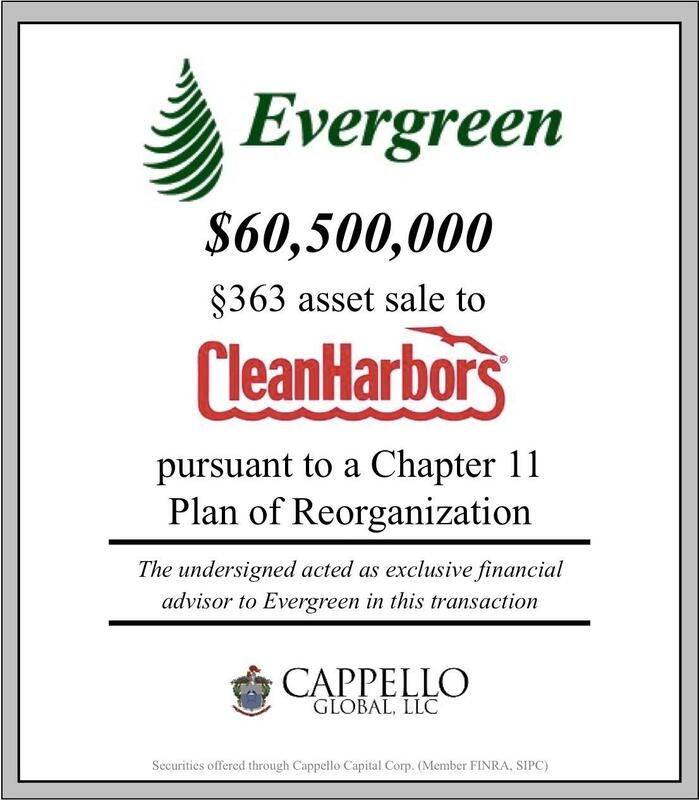 Cappello served as exclusive financial advisor to Evergreen Oil, Inc. 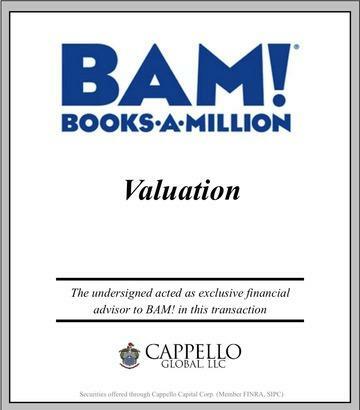 Ensuring that a valuation is accurate, complete and able to withstand potential legal challenges requires in-depth research, detailed financial analysis, deep and current market knowledge and an experienced valuation team. 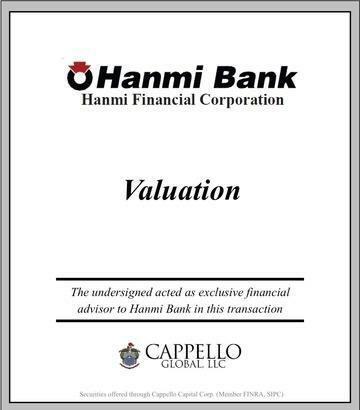 Cappello professionals have successfully completed a wide range of valuation assignments, from private and public company valuations to fairness opinions in connection with a major sale or merger. 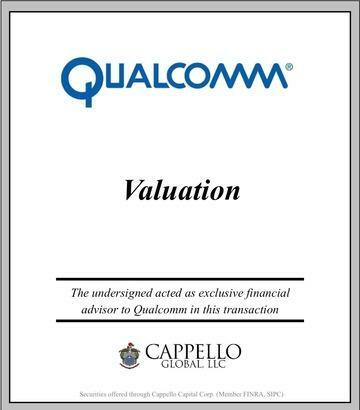 Our senior team focus, comprehensive due diligence, and fundamental approach to valuation analysis have earned us a reputation for delivering industry leading valuation services.